Among other offenses, Facebook’s never-ending parade of privacy mishaps is severely damaging its brand, new research suggests. From 2018 to 2019, Facebook saw its reputation take a nose dive on an annual rankin g compiled by Axios and Harris. This year, the social giant fell 43 spots -- more than any other brand -- to an unenviable rank of 94 out of 100. The few “brands” that performed worse than Facebook this year included the Trump Organization (#98), Phillip Morris (#99), and the U.S. Government (#100). From accusations of traumatizing workers to spying on people’s most personal information, Facebook now exists in a near-constant state of controversy. Despite its immense value as a marketing channel, Facebook’s problems have also impacted its relationship with brands. “The relationship between marketers and Facebook is strained,” Forrester analysts Brigitte Majewski and Jessica Liu suggested in a recent note. The increasingly uneasy ties between Facebook and Madison Avenue were on full display after news broke that the tech titan had placed profits ahead of user privacy last year. 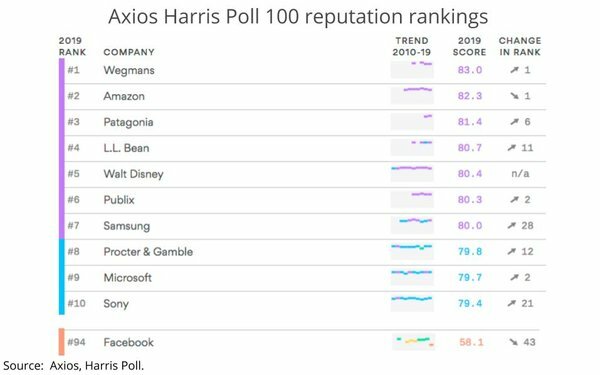 Twitter didn’t perform much better on the latest Axios-Harris ranking. The company was given a spot of 89, which was unchanged year-over-year. Google was given a rank of 41 after falling 13 spots over the past year, while Apple came in 32nd on the list. Remarkably, Amazon came in second (just behind Wegmans) despite experiencing its fair share of controversies over the past year. Also of note, Samsung rose 28 spots to achieve an impressive rank of 7 out of 100. Just behind the South Korean tech giant, Microsoft ranked 9th.